Happy Wednesday, everyone. 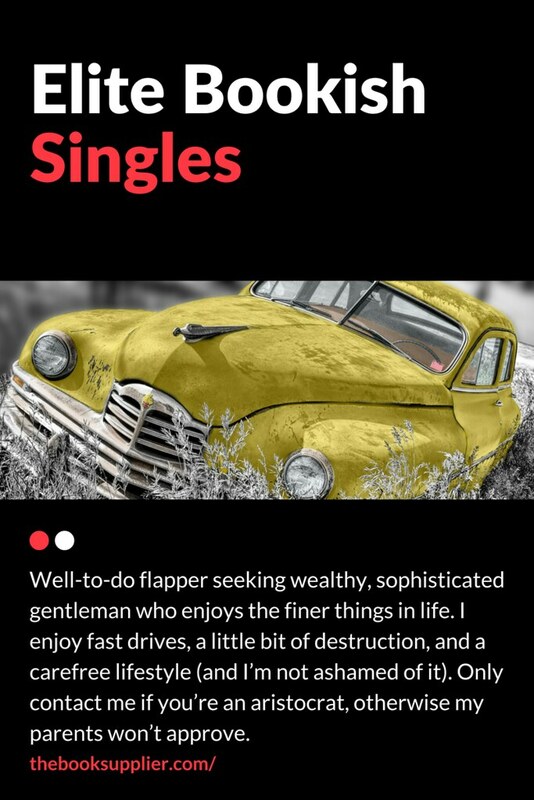 It’s time for our lovely new bookish game, Elite Bookish Singles. If you’re curious about the answer to last week’s personal ad, scroll down. This week we’re still going with the literature they teach in schools, (you know, the canon) but we’ll be a bit more recent with it. Leave your guesses, thoughts, or suggestions for future personal ads in the comments! Last week’s answer: Oedipus. Remember? He’s the guy who killed his father and married his mother. And when he found out, he poked his eyes out. This sounds like Daisy Buchanan, but I’m not sure about the bit about her parents. Is that why she didn’t end up with Gatsby originally? I can’t remember. That’s what I remember, but it’s been forever since I read it so I could very well be wrong.